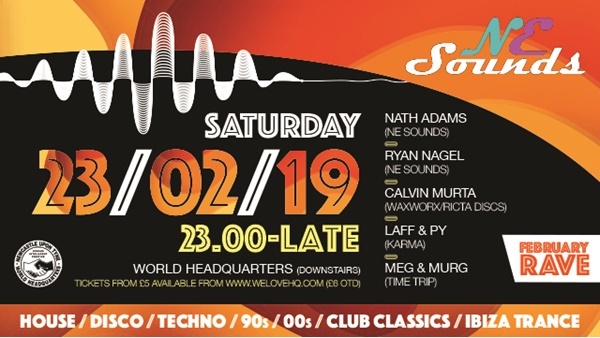 NE Sounds piece together their favorite tracks from the 90s,00s and modern day to unite hundreds of ravers and like-minded people in the cities greatest independent venue. Join the usual suspects, Nath Adams(NE Sounds), Ryan Nagel(NE Sounds), Calvin Murta(Wax Worx/Ricta Discs), Laff and PY(Karma) and special guest DJ'S/Time Trip residents Meg and Murg as they take you on a journey fuelled by their love of Dance Music. Expect a night of Euphoric House, Club Classics, Disco, Techno, and Ibiza Trance anthems. Online allocation has now sold out, we have kept spaces back so you can pay at the door for this event.